Cider and perry are enjoying a boom, but today’s new generation of cider enthusiasts want to do more than just drink cider. As sales of small-scale…mills and presses show, they want to try making cider for themselves. They also want to explore cider country – to drink in legendary cider pubs and learn more about orchards and apple varieties. The Naked Guide to Cider is a new kind of cider book for a new generation of cider lovers. It is a guide book, but not like a CAMRA guide. “The Naked Guide to Cider” will introduce cider lovers to the history and culture of their favorite tipple, and demonstrate, in vivid detail and with clear step-by-step instructions, how to make their own cider. At the same time it will help people to explore cider country, showing where they can stay and where they can drink, buy or learn about cider. Maps and directions are of course included. 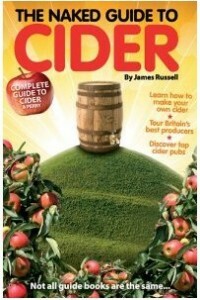 “The Naked Guide to Cider” will be down to earth, funny, informative and inspiring. It will have the ‘warts and all’ quality of an independent guide, but it will promote cider and perry passionately and argue strongly in favour of the local and organic.